Online or Postmarked by May 21, 2018, or you can “conditionally” register and vote at your county elections office after the 15-day voter registration deadline. Madera, Napa, Nevada, Sacramento, and San Mateo counties are replacing neighborhood polling places with one-stop vote centers and sending vote-by-mail ballots to all registered voters. Find your polling place or vote center. The race for governor features four strong Democrats and two Republican reactionaries. No state official has done more to champion legal marijuana than Democratic frontrunner Lt. Gov. Gavin Newsom. A longtime advocate of drug harm reduction, Newsom convened a Blue Ribbon Task Force on legalization that served as a blueprint for Prop 64, which he backed strongly. Some worry that Newsom is partial to big-money interests. As of last July, he had received over $300K in donations from the cannabis industry. Newsom has a history of leadership on other social issues, most notably gay marriage, which he championed as Mayor of San Francisco, as well as gun control and single-payer health care. Newsom has dealt with personal issues, including a bout with alcohol and cocaine addiction. Curiously he was the only Democratic candidate at a debate who did not raise his hand when asked if he had smoked marijuana. Former LA Mayor Antonio Villaraigosa, who is running second or third in the polls, raised his hand promptly. “And unlike some, I inhaled,” he joked. As speaker of the state Assembly, Villaraigosa was not a leader on medical marijuana or criminal justice reform, but consistently voted right. After becoming mayor in 2005, he quietly let medical cannabis dispensaries open up in Los Angeles, which had previously been a cannabis desert. Nine days before the 2016 election he endorsed Prop. 64. State Treasurer John Chiang, who also raised his hand, has used his office to help secure banking services for the state’s developing cannabis industry. Chiang convened a task force on cannabis and banking, in an effort to circumvent federal banking regulations that have made it almost impossible for many cannabis-related organizations to get bank accounts. His efforts have won him the endorsement of the Cannabis Growers Association. Assemblyman Travis Allen of Huntington Beach, the other Republican in the race, has been a reliably dismal vote in the legislature. Allen was one of only two Assembly members to vote against Gov. Brown’s trailer bill SB 94, to streamline and improve the state’s medical and non-medical regulation system. The Democrats have two strong candidates in this race. State Senator Ed Hernández (D-Asuza), has generally voted well and thoughtfully on cannabis issues, medical and otherwise. An optometrist, he has taken a special interest in health care access and pharmaceutical drugs. Hernandez sponsored legislation to outlaw the dangerous synthetic marijuana substitute “Spice” and to raise the tobacco smoking age to 21. The Democrats have another good candidate in Fiona Ma, who like Yee before her now serves on the Board of Equalization from San Francisco. Upon joining the board, she took a serious interest in the cannabis industry, talking to farmers and touring businesses to figure out how they could best be integrated in California’s legal economy. Like Treasurer Chiang, she has struggled to figure out how to provide banking services to cannabis businesses so they can stop having to deal in cash. Her efforts have won her support from the cannabis community. During her long career in public office, incumbent Dianne Feinstein has been a staunch opponent of all things marijuana. Though praised as a moderate on other issues, Feinstein has been one of the Senate’s leading drug warriors, vociferously opposing Prop. 215 and 64, and using her power on the Senate Judiciary Committee to block rescheduling, water down sentencing reform, impose tougher penalties against drugs and their users, prohibit more drugs. Shamefully, Sen. Feinstein was the only Democrat on the Judiciary Committee to vote against an amendment to prohibit Attorney General Jeff Sessions from interfering in California’s medical marijuana law, and another to protect banks from being prosecuted for serving the cannabis industry. Her stubbornness has led many Californians to think she is too old and out of touch for the job. In a stunning move, the state Democratic party declined to endorse her at its convention. Finally, in a stunning announcement one week before the start of voting, Sen. Feinstein announced that she is shifting her position and would drop her opposition to legal cannabis. Feinstein’s views are said to have been changed by meeting constituents, especially those with young kids who have benefited from medical cannabis. "Federal law enforcement agents should not arrest Californians who are adhering to California law," said Feinstein. Welcome as this announcement is, many voters are asking themselves whether it is too little, too late. 4th C.D. - Roseville - Incumbent Republican Tom McClintock is a rock-ribbed, small-government conservative who opposes federal interference in California's marijuana laws. He co-sponsored an amendment that would have barred the U.S. Dept. 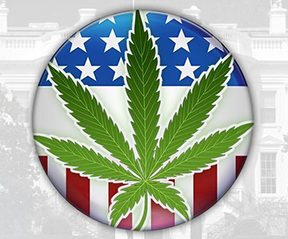 of Justice from spending funds to undermine state adult-use legalization laws. The amendment, modeled on the Rohrabacher-Farr amendment that protects medical-only marijuana laws, nearly passed the House in 2015 and hasn't been allowed to come to a vote since then. 10th C.D. - Modesto/Manteca - Incumbent Republican Jeff Denham is a social conservative with an atrocious voting record; his main Democratic opponent, as in 2014 and 2016, will be Michael Eggman, who "supports legalization in California, so long as it’s passed by the voters, the age of consent is 21, and, of course, it is still illegal to operate a vehicle while under the influence." 25th C.D. - Palmdale/Santa Clarita - Incumbent Republican Steve Knight has a mediocre "C" voting record, but has acknowledged that marijuana has medical value and should be reclassifed to Schedule III; his Democratic opponent Bryan Caforio was is in favor of Prop 64. 39th C.D. - Fullerton - Republican Edward Royce has termed out, and a crowded field of Republicans, Democrats, and Independents are vying for the seat. The top GOP frontrunners include Orange County Supervisor Shawn Nelson, who was the sole dissenting vote against a ban on cannabis businesses in 2017, and also favored suing the over the sanctuary state law. Also running on the Republican side are former state legislators Young Kim and Bob Huff. Both Kim and Huff have poor voting records, except on more recent regulatory bills, and Kim opposed Prop. 64. Democrats in the race include former Naval officer and lottery winner Gil Cisneros, insurance executive Andy Thorburn, pediatrician Mai Khan Tran, and attorney Sam Jammal. Their positions are not known. 45th C.D. - Irvine - Republican Mimi Walters, who has a NORML "D" rating in Congress and was on DPFCA's State Senate Hall of Shame, is the sole Republican on the ballot. She faces Democratic challengers Dave Min, a former adviser to Sen. Chuck Schumer and the Center for American Progress, and Katie Porter, a consumer protection lawyer and former student of Sen. Elizabeth Warren at Harvard Law. 48th C.D. - Republican Dana Rohrabacher has been a leading champion for cannabis in Congress, being the co-sponsor of the Rohrabacher-Blumenauer (or -Farr) Amendment that currently bars the U.S. Dept. of Justice from spending funds to undermine state medical marijuana laws. He is facing a challenge from within his own party from O.C. County GOP chair and ex-Assemblyman Scott Baugh who compiled a so-so voting record in the legislature. 49th C.D. - Oceanside/Dana Point - Republican Darrell Issa is not running for re-election in this seat, taking his terrible voting record with him. Rocky Chavez, another Republican with a bad voting record, has just taken the lead in the race for the open seat. Democrat Douglas Appelgate, who is well funded and polling well in his race for the seat, is endorsed by Americans for Safe Access. 50th C.D. - San Diego - Embattled encumbent Duncan D. Hunter is one of the few Republicans who has taken a strong stance for marijuana reform. He co-sponsored the "Respect State Marijuana Laws Act of 2015" the CARERS Act, and Charlotte's Web Medical Access Act. Hunter won an "All Star" rating from the San Diego Association of Cannabis Professionals, as did his opponnent, Democratic party activist and businessman Ammar Campa Najjar. AD 42 - The Brownie Mary Democratic Club has endorsed DeniAntionette Mazingo, based on the replies to a candidate’s questionnaire that was distributed at the 2018 CaDEM convention. AD 76 - Oceanside: Rocky Chavez has termed out and is running for Congress; Thomas Krouse (R), supports medical marijuana and was endorsed by San Diego Citizens for Patients Rights. District 8 (Amador, Calaveras, Fresno, Inyo, Madera, Mariposa, Mono, Sacramento, Stanislaus, Tulare, Tuolumne) - Republican contender and Fresno county supervisor Andreas Borgeas does not support the use or sale of marijuana. Also running: Independent candidate and Calaveras county supervisor Mark Belden, who is in favor of regulating cannabis like tobacco and alcohol, and Democrat Tom Pratt, who is in favor of both medical and recreational marijuana. District 12 (Fresno, Madera, Merced, Monterey, San Benito, Stanislaus) - Assemblywoman Anna Caballero has a good voting record. Also in the race are Fowler Mayor Pro-Tem Daniel Parra, Madera County Supervisor Rob Poythress, and the self-described "very conservative" Johnny Tacherra. District 16 (Kern, Riverside, San Bernardino, Tulare) - Democratic archeologist and activist Ruth Musser-Lopez is unopposed. On the Republican side, former Assemblywoman Shannon Grove has a dismal voting record; Gregory Tatum is also running. District 22 (Los Angeles) - There are no Republicans running in this district; Democrats on the ballot include Assemblyman Mike Eng, who has a good voting record. District 24 (Boyle Heights, Eagle Rock) - The Brownie Mary Democratic Club has endorsed Peter Choi, based on the replies to a candidate’s questionnaire that was distributed at the 2018 CaDEM convention. District 32 (Los Angeles, Orange) - Democrat Tony Mendoza, who resigned his post following a sexual misconduct investigation, is running for his seat again without his party's endorsement. He faces a crowded field of Democratic candidates. Republicans Ion Sarega and Rita Topalian are also running. Alameda County District Attorney: Incumbent Nancy O'Malley faces a stiff challenge from civil rights attorney Pamela Price, who has promised to overhaul the criminal justice system. Price, who is backed by George Soros' progressive Real Justice PAC, wants to ramp up investigations of police officers and reduce prosecutions of misdemeanors,including DUIs and domestic violence. She has also faced ethical questions. O'Malley is a respected mainline liberal with law enforcement support. Though not vocal on criminal justice issues, she has taken the initiative to help erase records of prior cannabis convictions under Prop. 64. Contra Costa County District Attorney: Incumbent Diane Becton, who was appointed to replace disgraced ex-DA Mark Peterson, calls criminal justice reform a leading priority and is endorsed by George Soros' progressive Real Justice PAC. Nevada County Sheriff candidate John Foster is endorsed by local activists; he has said he would prefer a regulated industry so that he can prioritize enforcement on bad actors. Sacramento County District Attorney & Sheriff: Criminal justice reform advocates strongly favor Democratict D.A. challenger Noah Philips over incumbent Republican Anne Marie Schubert, who has been cozy with the police unions and opposed legalization. They likewise strongly prefer Milo Fitch over incumbent Sheriff Scott Jones, who has spoken out against legalization and pandered to Trump on law enforcement and immigration. San Bernardino County DA Mike Ramos has said he will not automatically expunge old marijuana convictions, and wants to use past convictions to seek longer jail time. San Diego County: District Attorney & Sheriff - For years, the county suffered under the malign leadership of Republican D.A. Bonnie Dumanis, who took every opportunity to harass and prosecute medical marijuana defendants. Dumanis has now stepped down to run for County Supervisor. Her successor, Republican D.A. Summer Stephan, has continued Dumanis' heavy-handed policy. He is opposed by progressive Democrat Genevieve Jones-Wright, who is backed by Real Justice PAC, a Soros-backed group dedicated to electing "reform-minded prosecutors at the county and municipal level who are commiteed to using the powers of their office to fight structural racism and defend our communities from abuse of state power." Jones-Wright enjoys strong support in San Diego's cannabis community. Cannabis advocates are also strongly supporting Dave Myers for San Diego Sheriff. Myers has been openly critical of the count's over-policing of the cannabis community. "I will enforce a sensible approach to marijuana that permits safe access over black market options. The Sheriff currently has only one full time detective on opioid enforcement, but ten dedicated to marijuana enforcement. Have we ever seen an overdose death on marijuana?" Running for San Diego County Supervisor against the deplorable Bonnie Dumanis (see above) is progressive Lori Saldaña. As an Assemblywoman, Saldaña posted a solid pro-reform voting record, and in 2007 she sponsored a bill that would have made it state policy not to cooperate with DEA raids. Santa Barbara County: Sheriff candidate Eddie Hsueh has said he "supports the will of the voters, and the law of the land" and is supportive of the cannabis industry as a whole. However, he will use some of the tax money to regulate illegal grows. Merced County - Measure Y would authorize Merced to tax commercial marijuana businesses at $25 per square foot of cultivation space or 10 percent of gross receipts, whichever is greater, until the tax is ended by voters. PASSED 77%-23%. Nevada City - Measure F to tax cannabis businesses PASSED 86%. Pasadena - Measure CC would repeal the existing ban on commercial marijuana and allowing commercial marijuana businesses to operate in the city, subject to local regulations and taxation. PASSED 60%-40%. San Rafael - Measure G would authorize San Rafael to impose a tax on the gross receipts of marijuana businesses at a maximum rate of 8 percent per year for general spending purposes. PASSED - 82.5%. Santa Barbara County - Measure T would add a new section imposing a cannabis tax to the County Code. PASSED 76%-24%. - 2.5%-5% on microbusiness. Full text PASSED 58%-42%. Santa Cruz (city) - Measure T would repeal Measure K of 2006, which authorizes Santa Cruz law enforcement to enforce marijuana offenses at the lowest level of priority. The measure is thought not to be required now that Prop. 64 has legalized marijuana in California. PASSED 72%-28%. Yolo County - Measure K would authorize the County to impose a tax on marijuana business in unincorporated areas of the county at a rate of between 1 percent and 15 percent of gross receipts, with initial rates of 4 percent for cultivation and 5 percent for other businesses and with the ability to increase or decrease the tax by up to 2 percentage points each year. PASSED 80%-20%. Yucca Valley - Measure L would authorize Yucca Valley to allow state-licensed commercial marijuana operations including indoor cultivation, manufacturing, distribution, and testing. FAILED 68%-32%.